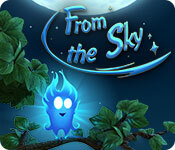 From the Sky is rated 3.2 out of 5 by 15. Rated 5 out of 5 by Ruckus777 from Not Your Average Match 3! Firstly, this game was absolutely beautiful. I felt entranced by the glowing pieces and gorgeous backgrounds, and the little character (just called "the hero") was super cute. Game mechanics were incredibly unique. Players guide the little character across the board by making matches near or with it to make it move. At times this proved to be an difficult feat, but for the most part it was a relaxing, fun game. The music in every level, which cycled between several different pieces, were pleasant and looped nicely. I'd definitely buy the soundtrack, since the melodies got stuck in my head. Definitely recommend! Rated 5 out of 5 by betskand62 from Very different Match 3 game When I got this the differences between it and every other match-three game were such that I didn't immediately understand all the details. It seemed ridiculously hard. But then (and this is a good reason to read the thoughts of others) I went through the comments about it and learned a couple of details I hadn't understood. Suddenly the game became really fun. Now I am enjoying it a LOT and playing it daily. But do check out some of the other comments of people who like it, especially if you have trouble with it initially. The instructions are a little daunting -- at least they were for me. One particular detail (that the "hero" tile can actually be PART of the match) that I didn't realize was making it much too difficult in the beginning. Rated 5 out of 5 by pennmom36 from Unique Game With Fantastic Graphics This is a very unique Match 3 game requiring you to click and drag a line of identical elements surrounding and including the little Hero. The object is to maneuver Hero towards the lock areas, and make matches next to the locks, which takes one match for each of the locks, usually 3 or 4 total. 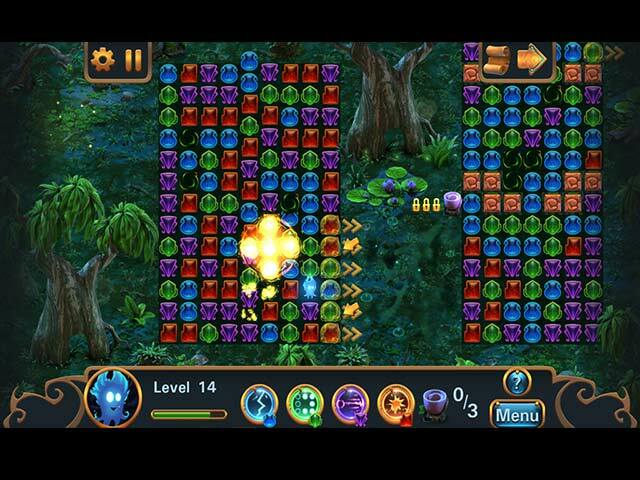 There are also several Light Orbs to collect as goals shown at the bottom of the screen with the same concept. The arrow at the top right corner shows you the direction to move towards because the boards continue as you advance. There are several unusual obstacles as well, balls of energy that will prevent the Hero from passing through until the energy balls disconnect momentarily so you have to time it just right.There are Labyrinths to reach by getting the Hero to the yellow square and then you click on several tiles to rotate pipe sections that will allow a continuous path. Brick tiles can be destroyed to open up passages my making matches next to them but other obstacles such as stone tiles require a power-up to destroy them. As you progress you will earn bonuses that will help you obtain your goals, Lightning will destroy 20 random elements, Conversion will change elements closest to the Hero to the same type, Explosion destroys cells closest to the Hero, and Teleportation moves the Hero to the selected cell. The graphics are crystal clear, bright and colorful, and the game really is different than any Match 3 game available. I enjoyed playing this game despite the fact that clicking and dragging type Match 3 games are my least favorite. I considered deducting a star when rating this game because I didn't feel the game was challenging enough to make me want to purchase the game, but I also realize that after the demo this game will surely become more difficult. With that being said, I will use a credit to play this one through.This game kind of reminds me of a modern version of Cradle of Persia, see what you think, enjoy! Rated 5 out of 5 by arnold1049 from A GREAT CHAIN-TYPE MATCH 3 Of all the ways to play a Match 3 game, the chain-type is my favorite, so this game is a sure buy for me. But that isn't the only reason I recommend this game. There is an 18 page guide with gameplay explanations as one of the menu options. Hints, if checked in the settings, will popup one of these pages when a new element of the game is opened. I played the demo and got through level 6 or 7 and part of one minigame. Along the way, I won 2 achievements, of which there are many. Completing level 8 was one of the achievements. Achievements include both quantity (clearing X number of Y-type tiles) and time (complete X matches in Y time). Most of them seem achievable with a little effort. Gameplay consists of moving the "Hero" across the board picking up "Lights" and conquering various obstacles until arriving at the final destination, at which point the level is completed. Points are awarded at the end of each level, but I never found where any use for the points was explained. Perhaps at a certain level, they unlocked the minigames? Minigames were accessed by a separate menu item and when I went to play one, I had a "fish" category available for play with another category locked. I did not make it through the only minigame I tried as the demo ended, but the object of the minigame was to keep fish from reaching the top of the grid by making matches in front of them, or by making matches underneath them to drop them from the board. Moving the Hero required making matches of 3, either using the Hero tile, or just the tiles next to him. 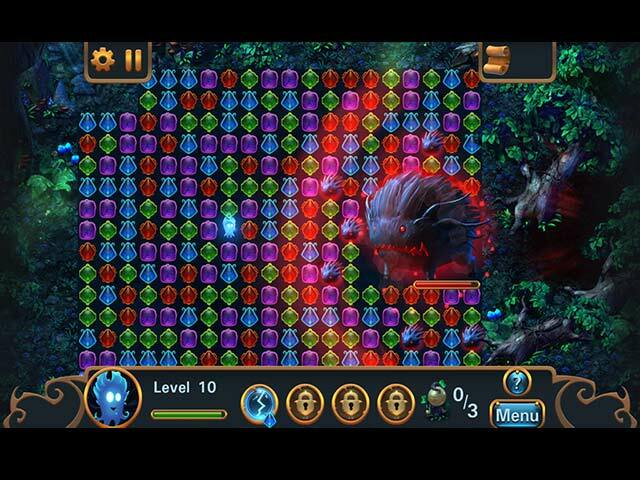 An arrow at the top of the screen shows in which direction you need to move the Hero through the board. Other arrows pointed out possible matches, but as with the majority of these games, the suggested match was usually the least effective of those available on the board. Obstacles that I ran into included stone tiles, that could be removed with making matches next to them; steel tiles that could only be removed with an explosion/power up; and electrical fields that must be crossed while the field is turned off. I got caught in a field and it "killed" the Hero, bouncing him back to the prior position. Powerups are available and access is obtained by completing specific matching goals. One powerup, lightning, removes 20 tiles at random places. The conversion powerup changes tiles next to the Hero to the same type of tile. So many things going on, so many things to watch for and so many things to do makes this game fun to play and fast-paced. Rated 4 out of 5 by graceland9 from Unique Macth-3 Game In this game, you make matches to move the little glowing alien along a path to the end. Chaining 3 or more matches moves the cute little guy along until he releases the light. Of course there are obstacles along the way, like blocks and energy balls. You have to make matches near the blocks or time the energy balls right to make it through the obstacle while making your chains. It's a unique idea - I just didn't connect with the idea. I prefer trying to set up huge chains or matches, but that's just me. Maybe it's for you - give it a try! Rated 4 out of 5 by SnigletII from Match three, or more, game! I like the game. Bit confusing until I found the map in the upper right corner. But why does it indicate I am on a specific level when I log in and a completely different level when I select play? Tells me I'm on level 20 and then level 17 after I hit play. And it does the same on all my computers. Rated 4 out of 5 by 99Rabbit from It's a good match 3 game, but not for the casual players Interesting, Interactive inter-terrestrial and play the game to get the feel of satisfaction. Rated 3 out of 5 by deddu from Help The Little Star Although the graphics are great, there doesn't appear to be much of a story and the panels are mostly the same. 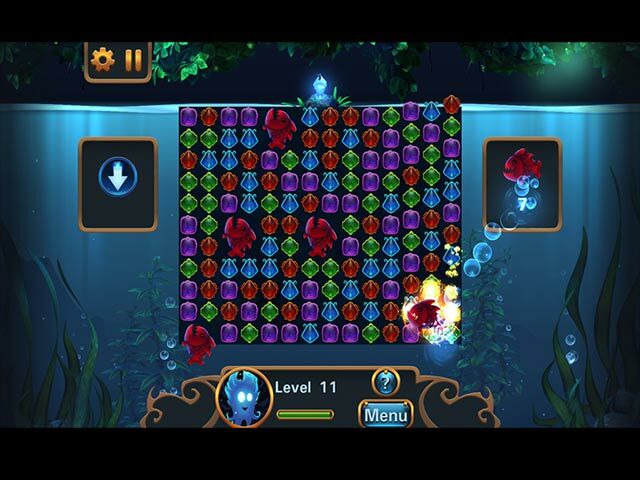 You must move the little Hero either across boards or up and down as the arrow in the upper right hand corner indicates. There are locks which open lights and you can move him around them or not. Try the demo first to see if you like this type of moving boards. Rated 3 out of 5 by JessF from Like the Concept, but Too Easy Unique game play. But I found it much too easy. I'm on level 30 and have not had to try very hard yet. The levels are all very similar. I keep hoping for a challenge, but am beginning to think there will not be one. That's too bad, because the devs were on to something here. Add a storyline and some variety and it could have been a winner. Rated 3 out of 5 by bessiegirl from I've played better Match 3 I guess I can't get as excited as the other reviewers over this one. Its hard to find Match 3's anymore and good ones are even more rare. Cute little game (I just played the demo) that offers some weak challenges so far. Maybe it gets better, but even if it does its kind of a sameo sameo gameplay. You guide this little flame guy through some obstacles to unlock some locks and light a light and then you move on to a new level w/a bigger game board. I'll probably buy since I use Match 3 as a break from Adventure games or as a time waster while a new game downloads, but only on sale...certainly not worth full price.